Now that Eleanor is in her new bedroom (which I’ll share soon! ), I can finally concentrate on August’s nursery. There aren’t too many big changes to be made, so it will be a quick makeover. I just need to find time to sew curtains and a crib skirt out of the Joel Dewberry fabric I bought for the room. Consistency in design and reusing furniture in different ways seems to be a calling card for me, yes? Making it Yours, baby. Making it Yours. We’re keeping the same crib, lighting, glider and ottoman, side table, bookcases (used as a changing table), and the paint color. I’m swapping out the curtains and crib skirt, as I mentioned, and bringing in some more orange pieces. Eleanor’s pink dresser is in her new room, so I have a more masculine wood dresser for the nursery now. Plus it’s named after my town, Oak Park! I’m switching the art to a print that I bought at the Renegade Craft Fair years ago by Three Sheets 2, and I also brought in two little orange chairs. I’ve made a page with a full list of sources (and Eleanor’s is here). Now hopefully I can find a little time for some sewing… and let’s hope it goes well! LOVE both rooms…but I adore the orange and green! Your babies are so stinkin precious by the way and I love watching them grew in your monthly pictures. Hope that you are having the time of your life! This is perfect. I love these choices. Your kids are going to grow up having such great taste. I wonder if you could tell us where yours came from? Your own mother or father? I would be fun if you could scare up some pics of your childhood home to share withe us. 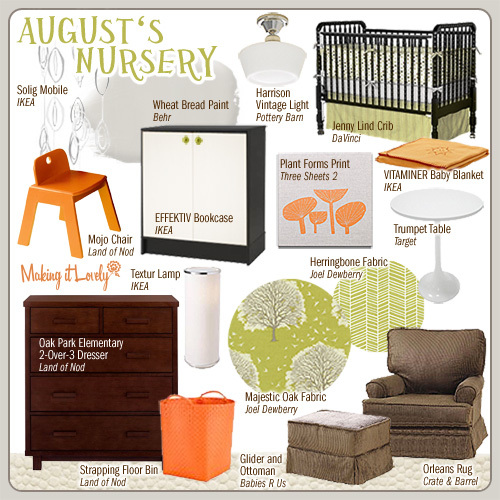 I love both rooms, but the green lover in me really loves August’s nursery! I might have a child just so I can think about a nursery room design. Ha! precious! 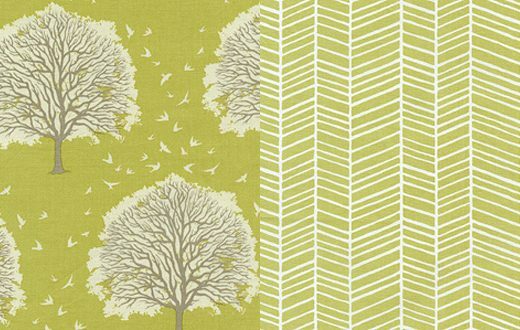 love the green fabrics you’ve chosen! just lovely! I just saw a little handmade bunny out of that Joel Dewberry fabric on Etsy! 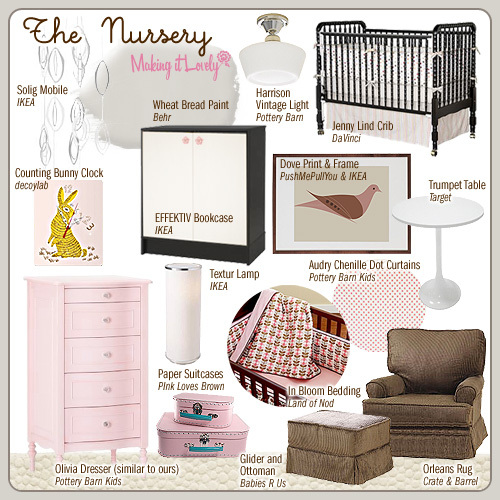 Love the new nursery plan! I think it’s great to re-use furniture and accessories where possible, and as you say, it’s easy to do when preparing a room for a new baby when your first child has moved into another, as there are so many essential things that you still need in the room. We’ll be having another baby in November (don’t know what we’re having yet), and I plan to use most of the furniture still (which was second hand in the first place) – depending on whether we have a girl or not (we have a boy now), I may need to paint some items in a different colour, but things like the cot and bookcase will still as they are as they are neutral anyway. Love both of your rooms, and look forward to seeing pictures of both finished rooms! Blimey! I know I’ve just left a long comment on here, but I just have to say this. I’ve just been reading the hard time that you got the other day about getting “free stuff” for your house. So sorry to see that you received such harsh comments, and well done for giving such an eloquent and professional response. What you do is your business (in both ways I guess), and you have clearly worked really hard to achieve everything that MIL is today. Yours was one of the first blogs I began reading, and I quickly read the entire archive. Perhaps if Kimberley had done that, she would realise just how hard you have worked, and seen how organically (but I’m sure with a kickass plan in the background! ), your blog has grown! Keep doing what you do Nicole! Oh I love the fabric and the print. Very soothing and I love the natural and modern vibe. Fabulous! I love the orange, brown and green. I am also very impressed with how little had to change for it to feel like a totally different room. Those little chairs rule, I wish I could afford one. I love the mix of orange and green. It makes for a wonderful modern twist. Love August’s nursery. What a lucky boy! I’m having my first baby (a boy) in a few months. I’m curious which Dwell sheets from Target you are using for his room? Thanks for your daily inspirations. And I’m glad you were given some free things from Land of Nod. You deserve it! Love the nursery! How is the Wheatbread paint as a gray? What kind of undertones does it have? We just moved (to Oak Park actually!) and we want to do several rooms in a gray. Love both, but I’m especially curious to see August’s come together with all those gorgeous pops of color! Can’t seem to find the table from Target. Is it discontinued? Any help would be great, thanks! I too love what you have done with both your nursery for August and your room for Eleanor! I have a son named August as well and noticed what looks like wooden letters that are being held together by magnets to spell your son’s name, August, and I was wondering where those came from? I love it all!! You are truly talented!! Thank you!